A 9-year-old male was referred to the cardiology clinic for evaluation of an asymptomatic diastolic heart murmur. On physical examination, a 2/4 early, medium-frequency, diastolic murmur was audible at the right mid-sternal border. The remainder of his physical examination was unremarkable and an electrocardiogram was normal. 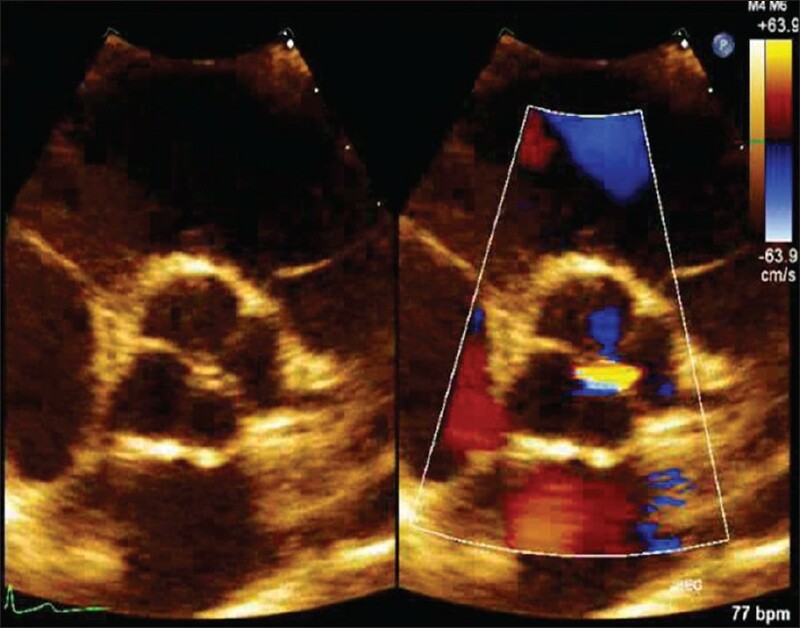 Transthoracic echocardiography showed a type B quadricuspid aortic valve (QAV) (three cusps of equal size and one smaller cusp) associated with mild aortic regurgitation by color Doppler imaging, likely from a coaptation defect [Figure 1] and [Video 1]. The left ventricular end-diastolic dimension measured by M-mode was normal (4.58 cm, z-score + 0.3) with a shortening fraction of 31%. The remainder of the cardiac anatomy was normal, including the origins of the coronary arteries. 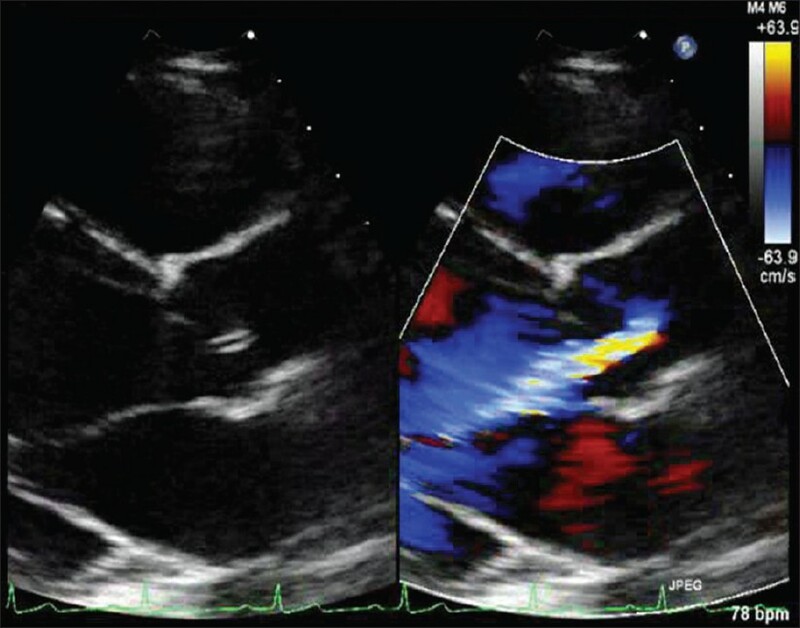 Two years later, the patient remained asymptomatic and the echocardiography showed stable, mild aortic regurgitation [Figure 2], now associated with mild left ventricular dilation [Figure 3]. By M-mode the left ventricular end-diastolic dimension measured 5.82 cm (z-score + 2.8), the end-systolic dimension was 3.7 cm (z-score + 1.9), and the shortening fraction was 35%. Aortic regurgitation is the most prevalent hemodynamic abnormality associated with a QAV and appears in up to 75% of the patients. This rarely develops in childhood and is thought to be a consequence of mechanical stress leading to leaflet fibrosis and malcoaptation over time. Many require aortic valve replacement later in adulthood. Our patient exhibited mild aortic insufficiency due to abnormal leaflet coaptation at only nine years of age, which caused a diastolic murmur and led to his early diagnosis. 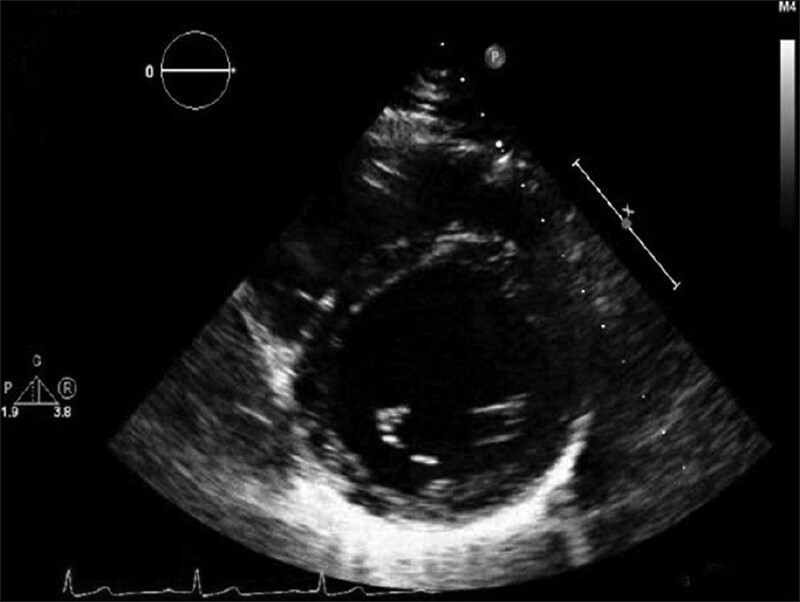 Although QAV is rare and uncommonly diagnosed in children, pediatric cardiologists should be familiar with this congenital malformation and its associated cardiac anomalies. Currently, our patient has mild aortic regurgitation with mild left ventricular dilation and preserved shortening. He will require a lifelong cardiology follow-up, with a possible need for intervention later in life. If your browser does not support / play this video file, right click here and select the option "Save Link As"
1. Hurwitz LE, Roberts WC. Quadricuspid semilunar valve. Am J Cardiol 1973;31:623-6. 2. Simonds JP. Congenital malformation of the aortic and pulmonary valves. Am J Med Sci 1923;166:584-95. 3. Feldman BJ, Khanderia BK, Warnes CA, Sweard JB, Taylor CL, Tajik AJ. Incidence, description and functional assessment of isolated quadricuspid aortic valves. Am J Cardiol 1990;65:937-8. 4. Tutarel O. The quadricuspid aortic valve: A comprehensive review. J Heart Valve Dis 2004;13:534-7. 5. Timperley J, Milner R, Marshall AJ, Gilbert TJ. Quadricuspid aortic valves. Clin Cardiol 2002;25:548-52.